Designed for manufacturing floors, clinical documentation, labs, distribution centers, and high activity areas, the lightweight streamlined Neo-Flex cart transforms any space into a productive sit-stand computing environment. Creating an optimal platform for point-of-need data input, the Neo-Flex cart helps improve viewing comfort, increase user accuracy and productivity while supporting wireless initiatives. 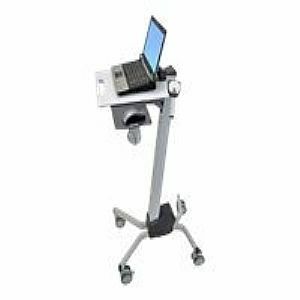 The Laptop Cart features Ergotron's constant force patented lift technology, 20-inch (51cm) effortless lift range, and an integrated laptop security system for theft deterrence and stability. Complete with a flexible open architecture design, this secure, low-cost solution supports mobile computing needs today and tomorrow.